Give your bedroom a contemporary and elegant look with the urban style of this queen size bed. A platform styled, upholstered bed, this bedroom furniture piece features a high upholstered headboard with button tufted accents for a traditional detail while clean lined sides and casual wood feet create a strong influence of the linear lines from contemporary design. Welt cord trim creates a casual accent, outlining the seams of this luxurious-looking piece. A perfect complement to rooms seeking a fresh and contemporary yet elegant style, this modern upholstered bed will bring a unique accent into homes. 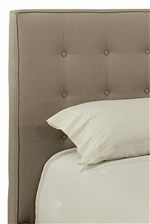 This elegant upholstered bed is available in full, queen and king sizes. The Bogart Queen Size Upholstered Bed with Tufted Headboard by Jonathan Louis at Williams & Kay in the Anchorage, Mat-Su Valley, Eagle River, Alaska area. Product availability may vary. Contact us for the most current availability on this product. 70450HB 5/0 Queen Headboard 1 5" 67" 51"
70450RL 5/0 Queen Rails 1 2" 67" 12"
Choose from a full, queen or king size bed with the Bogart upholstered bedroom collection. A group designed to blend the linear lines of contemporary styles with the tufted accents of traditional decor, this master bedroom furniture collection will create a stunning, finished bedroom look with a clean-cut style that is fully detailed with classic upholstery furniture accents. The Bogart collection is a great option if you are looking for furniture in the Anchorage, Mat-Su Valley, Eagle River, Alaska area.